The brothers Vladimir (1863-1934) and Anatoly Durov (1864-1916), who became iconic figures of the Russian circus before and during the Soviet regime, originated one of Russia’s most important circus dynasties. Their name still resonates today in Russian lore and culture, and Moscow has even a street named after them. To the circus historian, however, finding one’s way into the intricacy of their expanded genealogy tree is not an easy task; several descendants of both Vladimir and Anatoly share the same first name: Vladimir or Yury for the men, Natalia or Tereza for the women. Furthermore, the Durov line was kept alive principally through the women—two of whom never officially married their common-law husbands—and therefore many Durovs were given, or adopted, the famous moniker even though it was not their birth name. To make matters even more complex, nearly all of the Durovs were animal trainers, and the men worked in the same costume as their forebears, Anatoly and Vladimir—who were originally clowns and developed their animal acts as such. Although only a few of Anatoly and Vladimir’s descendents were actually clowns themselves, most of them presented their acts in the clown costume made famous by both brothers (who worked in exactly the same style), replete with an Elizabethan ruff and a short cape. To some extent, during the Soviet regime, most Durov acts seemed interchangeable. Note: A few descendents of the Durovs didn’t pursue an artistic career in the circus. They have been omitted in the following survey. Vladimir Vladimirovich, born January 19, 1888, was the son of Vladimir Durov, from his marriage to Natalia Ignatievna Karnaukhova (1870-1924). Vladimir Vladimirovich began performing an act similar to his father’s in 1907. His career, unfortunately, didn’t last: He died prematurely at age twenty-four, on February 14, 1912. Vladimir Durov’s daughter, Natalia, also died prematurely. She had a short career as a variety artist (with the Bi-Ba-Bo Variety Theatre), where she distinguished herself as one of the first female conferenciers (a mixture between a stand-up comedian and an MC), as well as a movie actress. She was married to Prince Vladimir Nikolaevich Orlov (1873-? ), Chief of the Imperial Funeral Office. She met a tragic death by sword in a political street uprising in Moscow during the Russian civil war. Sadly, like his siblings, the second son of Vladimir Durov met with a premature death: A Cavalry Cadet, he died during the Soviet Revolution. Born May 25, 1900, Anna Durova was the daughter of Vladimir Durov and his third wife, Anna Ignatievna Karnaukhova (Feb. 1, 1878-March 3, 1950), the sister of his first wife, Natalia Ignatievna (see above, A). An animal trainer who worked with her father at Durov Corner, Anna created there the Durov Animal Theatre in 1933. She was its Artistic Director until her death in 1978. Her niece, Natalia Yurievna Durova (see below, B.1.1) succeeded her. Anna Durova had married Prov Mikhailovich Sadovsky, a famous actor of the Maly Theatre in Moscow. Their son, Prov Provovich Sadovsky (1926-1992), continued in his father’s footsteps, and became himself a celebrated actor at the Maly Theatre. Anna Durova died in Moscow on March 2, 1978. She had been named National Artist of the Russian Soviet Federal Socialist Republic in 1965. Born on January 12, 1910 to Prince Orlov and Natalia Vladimirovna Durova (see above, B), Yury Durov was adopted upon his mother’s death by his grandfather, Vladimir Leonidovich Durov, and started working with him at Durov Corner as a child, from 1918 to 1928. He began his adult professional career as an actor in Yury Zavadsky’s Studio. 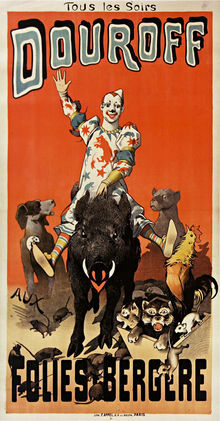 In 1936, he took over the animal act of Leonid Ivanov (1889-1936) upon the latter’s death, and began a brilliant career as an animal trainer, donning the traditional Durov clown outfit. In February 1971, he was taken ill during a performance at Brussel’s Cirque Royal in Belgium, and died a few days later, on February 22. After his death, he was named National Artist of the USSR. Yury Durov married twice: First to Zinaida Timofeevna Borodina (1912-1953), the granddaughter of the famous chemist Aleksandr Borodin; after Zinaida’s tragic death in a car crash, Yury re-married with Lola Khodzhaeva (b. 1923), an equestrienneA female equestrian, or horse trainer, horse presenter, or acrobat on horseback.. From Midkhat Begbudi, her first husband, Lola had a son, Sarvat Begbudi, who became a famous juggler on horseback and animal trainer—and is, by alliance, part of the Durov dynasty. The daughter of Yury Vladimirovich Durov (see above, B.1) and his first wife, Zinaida Borodina, Natalia Durova was born in Moscow on April 13, 1914 and made her debut in the ring at age 5, in 1939, in her father’s animal act. In 1952-54, she worked as an animal trainer for the Central Circus Management (predecessor of SoyuzGosTsirk, the Soviet state circus organization), then, in 1956, she began to work at the Durov Animal Theatre. In 1954, she had married Mikhail Panteleimonovich Bolduman (1898-1986), an actor at the Moscow Art Theater. In 1961-73, Natalia Durova worked for SoyuzGosTsirk, presenting an unusual animal act that featured a sea-lion, a walrus and a monkey. Finally, in 1978, she took over the Durov Animal Theatre, succeeding her aunt, Anna Durova (see above, D). Natalia Durova and Mikhail Bolduman had a son, Mikhail Mikhailovich Bolduman (b.1967), who is a biologist. In 1989, Natalia was made National Artist of the USSR. She passed away in 2007. Born October 11, 1954 to Yury Vladimirovich Durov (see above, B.1) and his second wife, Lola Khodzhaeva, Yury Yurievich worked with his father before taking over his act upon Yury Vladimirovich’s death in 1971. Yury Yurievich married a former showgirl, Vera Dmitrievna Buslenko, with whom he had a daughter, Natalia Yurievna Durova (b.1987). In 1993, Yury Yurievich Durov was made National Artist of the Russian Federation. Maria Anatolievna Durova was born on January 1, 1891 of the union (no marriage) of Anatoly Durov and Tereza Stadtler (1866-1934 or 35?). Tereza Stradtler was the daughter of Johann Stadtler, a German equestrian, and was herself an equestrienneA female equestrian, or horse trainer, horse presenter, or acrobat on horseback. who had run a circus in Bavaria, worked as a clownesse, and then as an animal trainer with Anatoly Durov. Maria made her circus debut at age 6, in 1887, in a musical act with her sister, Evlampiya (see below, C). She later worked as her father’s assistant in his mnemonic act, then as assistant to her brother Anatoly (see below, B). She married Vasily Vasilievich Milva (1884-1962), a hand-balancer, who later trained animals for his brother-in-law, Anatoly Durov. She died in Odessa. The second child of Anatoly Durov and Tereza Stadtler, Anatoly Anatolievich was born on November 26, 1894. He made his circus debut in 1914 as a clownGeneric term for all clowns and augustes. '''Specific:''' In Europe, the elegant, whiteface character who plays the role of the straight man to the Auguste in a clown team.-satirist, like his father. While working at Circus Nikitin in Moscow, he made anti-war jokes that resulted in his being sent to a camp for political prisoners in Siberia. Back to Moscow in 1917, after the Soviet Revolution, he returned to the circus and began working as a trainer, with a large animal act. Anatoly Anatolievich toured extensively in Eastern and Western Europe, and was in his days the most internationally known of the Durovs. He married Annette Yurievna Geld, a woman wrestler and circus strongwoman. Together they raised Vladimir Grigorevich Schvenchenko (see below, C.1) upon Vladimir’s mother’s death. Anatoly Anatolievich Durov died untimely on November 19, 1928 in a hunting accident. The third child of Anatoly Durov and Tereza Stadtler, Evlampiya made her circus debut in a musical act with her sister Maria Anotaolievna (see above, A), and served as her father’s partner in his mnemonic act. She married Grigory Efimovich Schvenchenko (? - ? ), a pharmacist, with whom she had a son, Valdimir Grigorievich Schvenchenko (see below, C.1). Elena Durova was born of the second union (no marriage) of Anatoly Leonidovich Durov with Elena Robertovna Gertel (1873-1967), a swimmer in Circus Shumann’s water pantomimes in Berlin, then at Circus Salamonsky in Moscow. She worked as Anatoly’s partner in his mnemonic act. Upon Anatoly’s death, she performed with small animals, before becoming the custodian of the Durov House (Anatoly Durov's former home) in Voronezh. Later, she married Carlo Giovanni Faccioli, an acrobat. The daughter of Maria Anatolievna Durova (see above, A) and Vasily Vasilievich Milva, Tereza Vasilievna Durova (née Milva) was born on September 7, 1926 in Voronezh. She started her career as an animal trainer at age 16, in 1942, and became famous as an elephant trainer—although she had also trained all sorts of exotic animals, from zebras to pelicans, in a series of spectacular mixed-animal acts. She was named National Artist of the Russian Soviet Federal Socialist Republic in 1980. Her first husband, Gannibal Vladimirovich Nadjarov was a circus musician. Together, Gannibal and Tereza had a daughter, Tereza Gannibalovna (see below, A.2.1). Her second husband, Viktor Ivanovich Kocherzhlenko (b.1939), whom she married in 1976, was sixteen years her junior. He was originally an acrobat, but upon his marriage with Tereza Durova, he participated in her act. Tereza Durova retired from performing in 2004, and died in Moscow on July 29, 2012. The State Circus of Penza, in Russia, has been re-named after her. Born Vladimir Grigorevich Schvenchenko on April 16, 1909, Vladimir Grigorievich Durov was the son of Evlampiya Anatolievna Durova (see above, C) and Grigory Efimovich Schvenchenko. Upon his mother’s untimely death, he was raised by Anatoly Anatolievich Durov (see above, B) and his wife, Annette. Vladimir Grigorevich, who was not originally destined to a circus career, studied at the Agricultural Academy, and then, probably responding to his Durov genes, studied drama at Meyerhold’s Experimental Theater. In 1928, upon the accidental death of his surrogate father, Anatoly Anatolievich Durov, Vladimir Grigorevich took over his act. He made his debut in the ring with it at the Circus of Izhevsk (west of Kazan). Two years later, in 1930, he changed his name officially to Durov. Vladimir Grigorevich had a soft and gentle style, which included many theatrical elements. Starting in 1958, he traveled extensively outside Russia with various editions of the Moscow Circus. He was perhaps the best-known Durov outside the USSR. Vladimir Grigorevich Durov was a member of the Editorial Staff of the circus magazine, Sovietsky Tsirk. He had married Regina Vasilievna (whose maiden name is not recorded), born in 1922. He died in Moscow on March 14, 1972. In 1967, he had been named National Artist of the USSR. Born on October 3, 1953 to Tereza Vasilievna Durova (see above, A.1) and Gannibal Nadjarov, Tereza Gannibalovna is known, like her mother, as Tereza Durova. She began to work with her mother as an animal trainer in 1966, and presented elephants and other exotic animals with her until 1977. In 1977, she entered the GITIS Institute (Theatre Institute) in Moscow, and graduated as a circus director two years later. From 1979 to 1988, she worked as an artistic director at the State College for Circus and Variety Arts in Moscow, where she had among her students such artists as Elena Panova, Nikolai Chelnokov, and Marina Golovinskaya. From 1989-90, as the Soviet Union was falling apart, she became director of Yury Kuklachov’s collective, Moskva. Then, in 1993, she created the Moscow Clown Theatre, where she spearheaded a new generation of young, highly creative Russian clowns. The Clown Theater then became a more eclectic theater venue, known today as the Teatrium. Tereza Durova married the former journalist and author Sergey Aleksandrovich Abramov—who eventually became a successful financier—with whom she had a son, Artiom Sergeyevich Abramov. She is featured in Le Dictionnaire universel des créatrices (Paris, Editions des femmes, 2013), a project supported by the UNESCO, as the creator, with Victor Fomine and Elena Panova, of a new trapeze style, and the teacher and mentor of a new generation of Russian clowns.